IP MicroDome 1080p UW-FOV IP66. Compact and stylish outdoor microdome. Regions of interest and E-PTZ. Motion and tamper detection. FTP, Dropbox and e-mail applications. 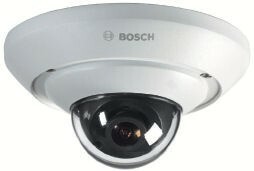 The Bosch HD 1080p and 5M vandal-resistant microdome cameras are professional surveillance cameras that provide high quality HD and MP images for demanding security and surveillance network requirements. The camera comes with a choice of lenses including an ultra-wide angle lens which provides outstanding performance without the need for de-warping software. The cameras are available in 1080p and 5M versions and there is a special version designed for Internal Vehicle Mounting (IVM) using an M12 connector. iDNR reduces bandwidth and storage requirements The camera uses intelligent Dynamic Noise Reduction (iDNR) which actively analyzes the contents of a scene and reduces noise artifacts accordingly. The low-noise image and the efficient H.264 compression technology provide clear images while reducing bandwidth and storage by up to 30% compared to other H.264 cameras. This results in reduced-bandwidth streams that still retain a high image quality and smooth motion. The camera provides the most usable image possible by cleverly optimizing the detail-to-bandwidth ratio. Ideal for indoor or outdoor use, the compact aesthetic design is suitable for installations where housing size and appearance are important. The cast-aluminum housing, polycarbonate window, and hardened inner liner can withstand the equivalent of 55 kg (120 lbs) of force (IK08). The camera is protected against water and dust to IP66 (NEMA Type 4X) standards. Mounting options are numerous, including surface, wall, and suspended-ceiling mounting. The camera is available in a 1080p resolution version at 30 images per second (ips) or a 5MP resolution version at 12 ips. The innovative multi-streaming feature delivers various H.264 streams together with an M‑JPEG stream. These streams facilitate bandwidth-efficient viewing and recording as well as integration with third-party video management systems. The camera supports time-based or alarm-based JPEG posting to four different accounts. These accounts can address FTP servers or cloud-based storage facilities (for example, Dropbox). Video clips or JPEG images can also be exported to these accounts. Alarms can be set up to trigger an e-mail or SMS notification so you are always aware of abnormal events. Power for the camera can be supplied via a Powerover- Ethernet (IEEE 802.3af) compliant network cable connection. With this configuration, only a single cable connection is required to view, power, and control the camera. Using PoE makes installation easier and more cost-effective, as cameras do not require a local power source. The camera (non-IVM versions) can also be supplied with power from +12/24 VDC power supplies. To increase system reliability, the camera can be simultaneously connected to both PoE and +12/24 VDC supplies. Additionally, uninterruptible power supplies (UPS) can be used, which will allow continuous operation, even during a power failure. For trouble free network cabling, the cameras support Auto-MDIX. NUC-50022-F4 IP MicroDome 1080p IP66. Compact and stylish outdoor microdome. Regions of interest and E-PTZ. Motion and tamper detection. FTP, Dropbox and e-mail applications. NUC-50051-F4 IP MicroDome 5M IP66. Compact and stylish outdoor microdome. Regions of interest and E-PTZ. Motion and tamper detection. FTP, Dropbox and e-mail applications. NUC-50022-F2 IP MicroDome 1080p UW-FOV IP66. Compact and stylish outdoor microdome. Regions of interest and E-PTZ. Motion and tamper detection. FTP, Dropbox and e-mail applications. NUC-50022-F2M IP MicroDome 1080p UW-FOV IP66 IVM. Compact and stylish outdoor microdome. Regions of interest and E-PTZ. Motion and tamper detection. FTP, Dropbox and e-mail applications. NUC-50051-F2 IP MicroDome 5M UW-FOV IP66. Compact and stylish outdoor microdome. Regions of interest and E-PTZ. Motion and tamper detection. FTP, Dropbox and e-mail applications. NUC-50051-F2M IP MicroDome 5M UW-FOV IP66 IVM. Compact and stylish outdoor microdome. Regions of interest and E-PTZ. Motion and tamper detection. FTP, Dropbox and e-mail applications.